Going from the core of Vienna (the historical first district) towards the outskirts and the Gürtel Road, you travel from the middle ages to the late 19th century in terms of churches. Most churches in the first district date back to the time before the Second Siege of Vienna in 1683. The churches in the former suburbs (districts two to nine) are full with high-Baroque churches from just after 1683 (the Turks had flattened the previously existing ones); and the area near the Gürtel was finally developed during the Gründerzeit and has many historicist churches. The ones of high-Baroque style from just after 1683 include elaborate masterpieces such as the Karmeliterkirche, the Rochuskirche, the Mariahilferkirche, the Piaristenkirche - or the Ulrichskirche. The Ulrichskirche Church occupies a very central site in the seventh district or Neubau. The origins of the Ulrichskirche reach back to 1211, when a wealthy merchant built a little chapel on this site that was dedicated to St. Ulrich. It became the core of a small village called Zeismannsbrunn, just off the Spittelberg neighbourhood that had developed with the hospital. In 1302, the Ulrichskirche Chapel became the property of the Schottenstift Abbey. In 1473, the Chapel of Ulrichskirche became the site of a disaster: During a storm, the roof collapsed and the falling wooden poles, bricks and shingles killed the priest, chaplain and 30 locals who all attended mass. The church was re-built, but destroyed again in 1529 - in the course of the First Siege of Vienna through the Ottoman Empire. The church was re-built and in 1589, St. Ulrich became an independent parish. About a century later, the Turks returned upon the occasion of the Second Siege of Vienna. Once again, St. Ulrich was flattened - alongside with dozens of other churches in the surroundings of Vienna. According to legend, the commander of the Turkish troops, Kara Mustafa, used the tower of St. Ulrich as a lookout to follow the attacks on Vienna. After the second (and more permanent) defeat of the Turks, the church was fixed and equipped with a painting of the Virgin Mary. This piece of artwork is still in St. Ulrich, alongside with a wooden statue of Mary that was made according to the painting - in 1699. In 1613, a plague column or trinity column was built in a similar design as the Pestsäule on the Graben. Since the Second Siege, the old church of St. Ulrich was in rather bad shape. Only in 1721, the current church was built - originally with one tower only. Later it got a twin tower like most Baroque churches of this period. The nicest thing about St. Ulrich is in my opinion the steeply ascending surroundings, making the square in front of the church as cosy unit. Note the staircase that bears statues of the four saints Ulrich, Aloisius, Johann Nepomuk and my patron Saint Benedikt. 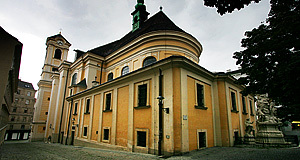 In Vienna, St. Ulrich has one major claim to fame - it was the church in which the Waltz-composer Joseph Lanner was baptised in 1801. Since Lanner is virtually unknown outside of Austria, this is not reason to go to the church - I would rather recommend it for the inviting plaza, the alleys with bars, restaurants and independent shops in the surroundings of St. Ulrich. Attractions nearby are numerous - within walking distance, you find the Spittelberg, the Stiftskaserne, the MuseumsQuartier with its many attractions, the Volkstheater, the Palais Trautson, the Justizpalast and the Palais Auersperg. The area of the Eastern 7th district is wonderfully neglected by tourists, yet among Vienna′s most charming ones (at least in my humble opinion).